There are several things in common between Australia and Hawaii. But if there’s one thing that’s shared by the two, it’s great love for festivities, especially during the Christmas season! If you’re tired of the usual holiday party themes and if you think you’ve used up all of the ideas you know, why not try something new? A combination of Aussie and Hawaiian, perhaps? Christmas in Australia and Hawaii are no different. You have the sun instead of snow, beach music instead of urban Christmas songs, and tropical fruits and ham instead of turkey or braised lamb. That said, mixing the two to come up with a theme for your next Christmas party isn’t really a case of attempting to square the circle. Here, we’ll give you tips on hosting a Christmas Party the Aussie-Hawaiian way! Make your Christmas party one that is to remember even before it happens with a surfboard invitation. While Hawaii is more known for beautiful beaches and the locals’ love for surfing, Australia has also made a reputation when it comes to water sports. You can come up with a custom-designed surfboard-shaped typographic card for this one. Or, if you have time, and if you think it would be worthwhile, you can have the invites carved! It’s a bit of a challenge to mix Australian and Hawaiian themes in one party, especially when it comes to decors. What you would want to do is focus on the details instead. Since it’s Christmas, why not opt for a pineapple Christmas tree? Adorn the crown of the fruit as you would an actual Christmas tree using Christmas ball ornaments and the like. 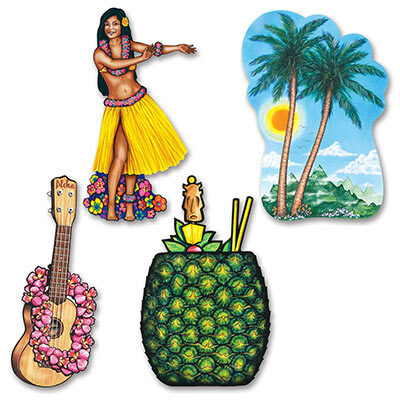 You can dress up your gingerbread man with a hula and hang it as well. Flower leis can also be hanged on every corner. And for your crowning touch to your pièce de résistance – an eye-catching starfish! Part of the fun of an Aussie-Hawaiian Christmas party is seeing everyone dressed in their best tropical attire. Aussies don’t really have a particular piece of attire they wear for informal parties, but since this one’s a mix with Hawaiian, and because it’s Christmas, you can just tell your expected guests to come dressed up for the party with something they’d wear for summer. 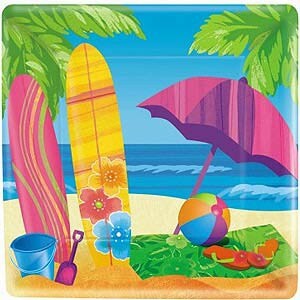 Hawaiian print shirts, sunglasses, flip-flops, straw hats, leis and grass skirts, would all be perfect for the theme. “Luau” is synonymous with “feast,” so make sure food is plentiful at your party. Grilled salmon or any similar fish is a great main course. If you don’t want to do much cooking, pizza with ham should be an easy dish to prepare. Kebabs should be definitely on the list, too. And of course, add to that fruits, fruits, and lots of fruits for dessert. Your guests will definitely find watermelon Christmas tree to be both fun and delicious. To give it a touch of Australian, don’t forget to serve fairy bread, cabanossi and cheese, chocolate crackles, devon rolls, honey joys, and of course, chocolate spiders! A Luau party is always accompanied by great music, so to keep everyone entertained throughout the evening, make sure you have some delightful Hawaiian music playing non-stop in the background. Both the “A Merry Hawaiian Christmas” album and some Aussie Christmas medley are sure to have guests dancing and singing all night long. This entry was posted in Christmas Party, Hawaiian, Party Supplies Online and tagged adult christmas party, Aussie-Hawaiian Party, christmas party ideas, Hawaiian Christmas, themed christmas party on December 21, 2017 by Mercurian.